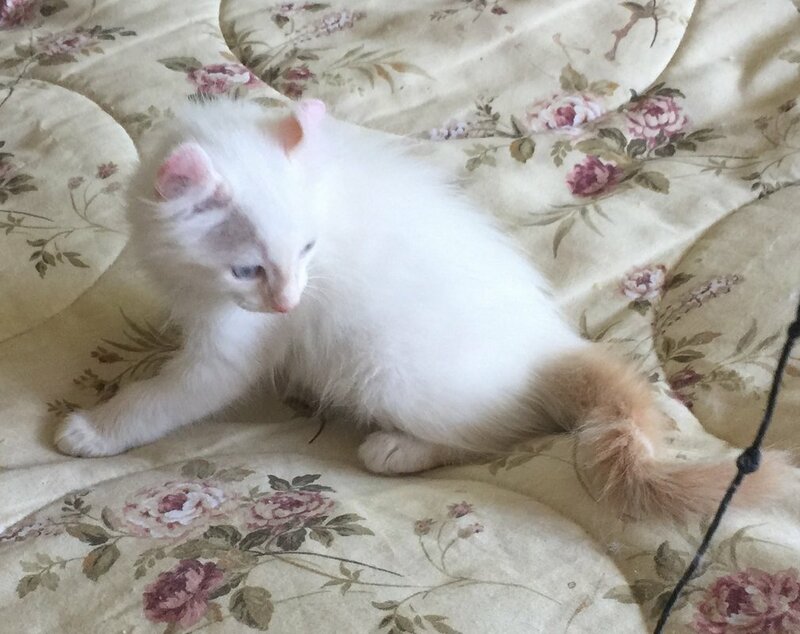 ​Chalice has one kitten still available... little Curl of Great Price, or "Price". Price a flame point boy with deep blue eyes. 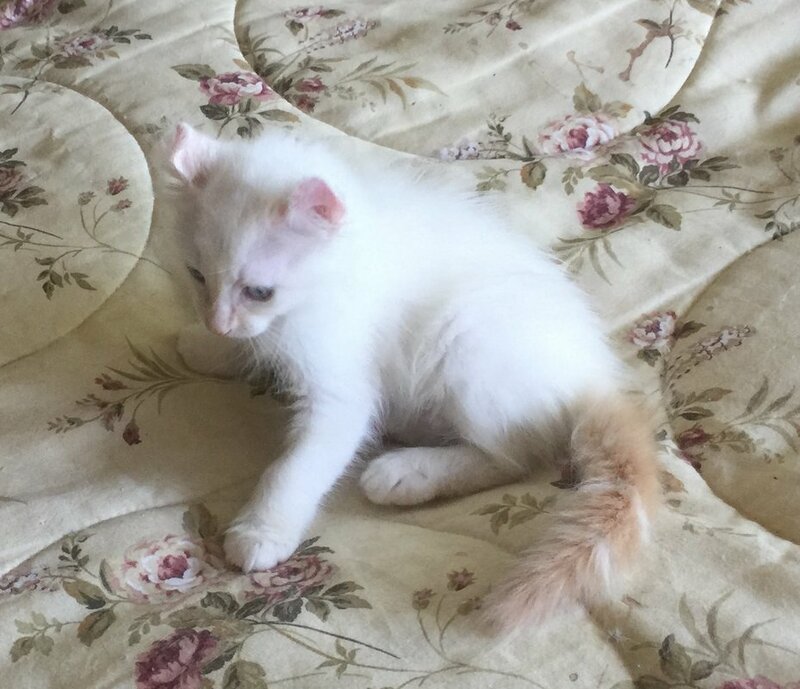 We named this flame point boy, Curl Essence Curl of Great Price, or "Price" for short. Price has that "something special" about him. Price is a breed/show quality cat. We took a lot of pics of his ears and body to show the incredible curvature of his ears. The slideshow below shows Price's coloring, body length and boning. I love the way Price 'holds himself'... there's and elegance to it... it's all in the neck and shoulders. The best way I can describe it is if you've ever seen a proud horse and the way he arches his neck when he moving... he's saying 'look at me... I'm something special, and you should take note". I just get that same feeling with Price. I took these in the afternoon and the sun had already gone past the bedroom windows. Morning light is better for taking pictures in the bedroom. Price is BRIGHT WHITE all over his body with the red on the tail and the smidgin of color that's coming in on the face. These shots are of Price's head shape and eyes. He's got deep blue eyes, well placed ears, and strong chin. His profile could be more defined, but he does have a respectable change of direction... a VERY, VERY minor rise on the nose, but not enough to call it a bump. We've been trained on how to evaluate a Curl by Grace, founder of the breed. She's the picky-ist person you will find for Curls so we're probably just being extra picky about the profile. The real money shots" are the ear pictures below. LOOK AT THOSE EARS! OMG! They are tall, curled nicely and well placed on his head. OK... Day Two in the bedroom and the kitties are all playing and having fun. Below are better pictures of both Price and Valerie and a pretty long video. Price has a special quality about him. I don't know how to describe it other than to say I get a feeling of elegance when I watch him. His coloring is going to be striking... but it's more than that. If you've been watching our website for sometime, or if you are a newbie to our site, you should get a sense of our extensive experience with Curls.... he's got that special character... He's not rambunctious, but he loves to play. We've seen 100's of Curl kittens over the years. They all have their special and unique personalities. Some will do better in a more active home and some in a quieter home. From what I can see of these two kitties, both would be fine with kids, other pets or a quiet home. Price has been more cautious than Valerie, but that could just be that he takes a little longer to adjust to the change in his environment. Taken Day One in the bedroom at 8 weeks. Price has THE MOST BEAUTIFUL deep blue eyes. Against his pure white face, the eyes are AMAZING! I tried to get some good face shots and show the color on his tail. I don't know that we've ever had a flame point that had this much color in the tail at 8 weeks. The red color always comes in slower on the color points than the seals, blues and browns. I'm not seeing any color on his face or feet yet. That may come in more as he matures, but the bright white body with a deep red tail and deep blue eyes is going to be incredible. It took Storm nearly 2 years to develop his color. Price's red coloring will continue to darken for probably until he's a year old...maybe longer. The video on the left below was taken in the afternoon at the same time as the one above. The on the right was taken first thing in the morning. The kitties have these different play times. One starts about 6 am and goes until around 8-9am. Then, they crash until it's time for round 2 which starts around 11am and only lasts an hour or so. Then, they sleep most of the day with little romp periods. The last big burst of energy seems to come around 8-9pm when we come in to settle down. You have to excuse the laundry basket in the video on the right below. Mike wasn't planning to shoot video of the kittens but he thought they were just too cute so we agreed to share the video. You'll notice in the video above and below that Valerie is the real player. She doesn't seem to care who else is chasing the toy... she's on a mission. IT'S GOING TO BE HER'S... PERIOD! Price is a little more gentle and when Mac comes into the game, even he's overwhelmed by Val's enthusiasm.